Many RPCVs have kept journals of their life in the Peace Corps and some of them have turned these journals into books or into newspaper columns. The best example is probably Moritz Thomsen who originally published parts of what was to become his Peace Corps Classic "Living Poor" as columns in the San Francisco Chronicle in the mid-1960's. One volunteer who is following in Thomsen's footsteps is Christie Appelhanz, a Peace Corps Volunteer who is currently serving in the Ukraine, and who for the past year has published more than a dozen of her essays on life as a PCV in the Topeka Capital Journal. POLTAVA, Ukraine -- The teachers looked at me like I was a combination of Santa Claus and Jesus Christ: Their Peace Corps volunteer should bring gifts and perform miracles. High expectations, indeed, for someone whose official job description reads "teach applied economics and business English" at the Ukrainian high school for the next two years. Americans have a reputation for securing grants and getting things moving in this country, so I was an instant celebrity. When the students first asked for autographs, I worried someone told them I was Christina Aguilera, instead of Christie Appelhanz. But I was paraded around the Poltava school with the same fanfare the singer could expect. I wonder how I can ever live up to their ideals. Then, bits of forgotten Peace Corps training classes started coming back to me. Something about relaxing and taking it one day at a time. The 200-kilometer trip to Poltava took eight hours -- the same amount of time as my flight to Europe from the United States. It was a journey through a pre-modern world of dirt roads and horse-drawn carts. 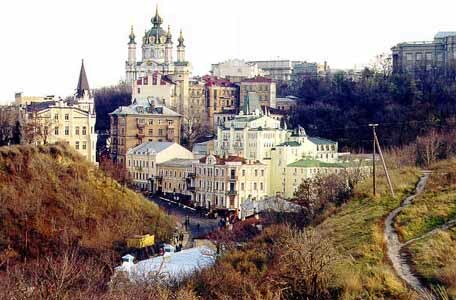 Poltava is a charming city of 350,000 people designed after St. Petersburg, Russia. Some merchants even advertise the ultimate sign of being cosmopolitan in Ukraine -- they take Visa. From the outside, the Poltava high school didn't look different than one in the United States, except for a few much-needed repairs. The front doors haven't been used for years because the steps leading to them are unsafe. The 1,500 students enter through a single side door. Once inside, I felt something was missing. Like most Ukrainian organizations, lights are used only when absolutely necessary to cut costs. This wasn't it. I asked about Internet access. My future boss looked confused. Then I saw a secretary working away on a manual typewriter. The school doesn't own computers. It wasn't any more promising when I requested a copy of the textbook I'll be teaching from. Books are expensive was the only answer I could get. Still, I was brimming with idealistic enthusiasm as I stood before my first class, ready to tackle "the toughest job you'll ever love." Ready to help the Ukrainians move to a capitalist economy. Ready to answer any question on the minds of the young students. First question. The one every Peace Corps volunteer must endure over and over: Why don't I have a husband? In a country where most marry at 18, I'm an old maid at 25. Then came how many hours a night do I sleep? Does my house in America look like the ones on "90210"? Do girls in America cheat on their boyfriends? Still waiting to talk about everything from the stock market to the Bill of Rights, bits of training classes once again come back to me. Something about relaxing and taking it one day at a time. Fortunately, I picked the right week for that. International Women's Day -- a holiday I plan to lobby for when I return -- is bigger than Christmas in Ukraine. I was congratulated simply for being a woman with flowers, chocolate and two containers of deodorant. Then came the performances. The local television cameras captured my tears of joy as I was welcomed with a traditional Ukrainian bread-and-salt ceremony. Ukrainians are famous for their hospitality. Now I know why. I should have packed an overnight bag when my boss invited me over that evening for dinner. After a four-hour meal, they asked if I liked cherries. My affirmative answer sent them running to the kitchen. Before I knew it, there were canned cherries, two kinds of cherry juice and cherry jam. No Ukrainian holiday is complete without the national delicacy I've managed to avoid for a month. Take my word for it, salo -- raw pig fat eaten with black bread, salt and garlic -- is just as nasty as it sounds. Five meals and 36 hours later when I finally announced I had to go, my host said she didn't understand why I was leaving so soon. Before I could escape, the babushka -- literally grandmother but used to describe any old woman -- next door stopped in to see "the American." She patted my head and said my mother must worry about me being so far away. I didn't know how to say "she's kind of freaking out" in Ukrainian so I showed her a family picture. She said my mother is beautiful, then disappeared. I wonder what the old woman thought of Americans during the Cold War. I wonder if she ever thought she would be sharing her sunflower seeds with an American. I already know the answers, so I decide to stop thinking so much. Then something from training class comes back to me. Something about relaxing and taking it one day at a time. Christie Appelhanz is in Ukraine volunteering with the Peace Corps. Her column will appear each month in Prosper. She can be written at US Peace Corps/Ukraine, PCV Christie Appelhanz, P.O. Box 204, Kyiv, 01001, Ukraine. This PVC took early termination of her Peace Corps assignment. These columns in Capital-Journal end abruptly with no explanation. Let's hope this volunteer is OK.